First, I must say that the first Insidious is an extremely well-made and efficient horror film. Many found the film’s third act to be a bit hokey. You either go with it or you don’t. I liked it. I can’t quite say I was necessarily eager for a sequel but here we are. Insidious Chapter 2 feels a little disappointingly mostly because it’s simply not as scary as its predecessor and director James Wan is coming right off the huge success of the supremely scary and intelligent summer movie “The Conjuring.” Any sequel to a supremely scary film is never going to be quite as scary because it automatically lacks the most important factor: the unknown. However, while the film ultimately doesn’t really need to exist, the filmmakers have a done a decent job deepening the mythology while cleverly incorporating the events of the first film into this next entry. Insidious Chapter 2 takes pretty much exactly where the first film left off. In fact, you must have a strong knowledge of the first film or you’ll pretty much be completely lost. 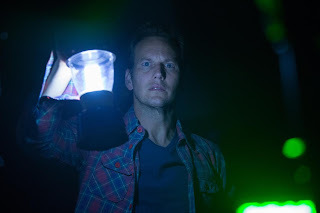 It also relies on flashbacks to the childhood of the adult Josh (Patrick Wilson) who we learned from the first film had the ability to leave his spiritual body while sleeping. It’s a gift he passed to his son Dalton and in the first film a demon attempted to take control of the child. We get to see young Josh as he experiences his own ghoulish encounters . Josh doesn’t seem quite right after the events of the first film, which left him as the suspected murderer of an elderly medium named Elise (Lin Shaye). He’s eventually cleared of the murder, though his wife Renai (Rose Byrne) thinks he’s not acting quite right. Meanwhile Josh’s mother Lorraine (Barbara Hershey) teams up with the a younger pair of psychic investigators to figure out the connection between the events that occurred during Josh’s childhood with what’s happening in the present. It’s all a tad convoluted. And that’s where we have our problem. The characters are embroiled in a somewhat interesting mystery but nothing they encounter is nothing quite as terrifying as what we saw in the first film. Although I did like the mystery element and the events of Josh’s past eventually make sense with what’s happening in the present. Even screenwriter Leigh Whannell, who also plays on the of investigators, has fun going back to the events of the first film and seeing things from a slightly different point-of-view ala “Back to the Future Part II.” It’s extremely clever I’ll admit, though I’m not sure how much actually sense it makes. But it sort of dug it. “Insidious” was made on a literally a shoestring budget, but you’d never know it. Chapter 2’s budget is slightly higher, but it retains the same look and feel as the original. A significant portion of the film takes place in the ghostly world of “the further” and it’s certainly an interesting world they’ve created. Many people will likely roll their eyes, but I care enough about the characters to just go with it. The problem lies in the fact that we’ve seen most of this stuff before and it was must scarier the first time and the plot remains slightly hokey – much more so than the first film. 0806jejeAssurez-vous asics gel lyte iii lc beige de visiter la ville avec des coupons Metropolis nike air jordan 11 xi retro low Discovery pour posséder nike air max thea portée les meilleures offres à des chaussures homme new balance avis prix abordables. Faire cet exercice est air jordan future bleu pas cher un grand soulagement pour soldes basket nike air max les douleurs au pied nike femme basket et au bas du dos arthrite.